There’s more to effective gutter maintenance than just the occasional cleaning. That’s why Mike’s Window and Gutter Cleaning is happy to provide light gutter repair work in addition to cleaning your gutters of built-up dirt and debris. Whether you need a loose gutter reattached or downspout repair, simply leave minor guttering repairs to our family-owned company in Kansas City. Since 1985, we’ve been the local gutter repair service to count on for prompt, reliable outcomes for residential and commercial properties alike. Don’t put off small gutter repairs now and end up with big water problems later. Contact us today to schedule gutter cleaning and repair! Constant exposure to the elements can be rough on your gutter system, leading to gutter repair issues from sagging sections to disconnected downspouts. Fortunately, the team at Mike’s Windows and Gutter Cleaning is just a phone call away to help you address these common gutter repairs swiftly and properly. Staying on top of rain gutter repair is vital to safeguarding your property from potential water damage from foundation erosion to poor yard drainage and beyond. Regardless of what type of gutters you have on your home or business, Mike’s Window and Gutter Cleaning is here to help with everyday gutter repairs. We clean and maintain all types of gutter systems, including seamless gutters. Plus, we offer reasonable rates on guttering repairs, so you don’t have to spend a lot to get first-class workmanship for your Kansas City-area property. We’ll bring you gutter repair service done right, at a price that won’t blow your budget. To keep your residential or commercial gutters in tip-top condition, be sure to include gutter repair service as a regular part of seasonal gutter upkeep. Mike’s Window and Gutter Cleaning can help you make quick work of light gutter repairs with our efficient and effective services for property owners in Kansas City and beyond. Reach us by phone or e-mail to set up your appointment for gutter cleaning and repair. We’d love to add your name to our list of happy customers. 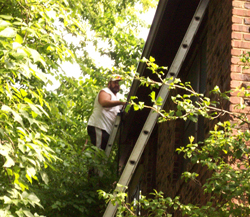 Why haul out the ladder when all you really need to do is pick up the phone and call us for rain gutter repair? We’re licensed and insured gutter repair pros, and we’ll work hard to meet your needs. Call Mike’s Window and Gutter Cleaning today! At this time, we only provide gutter repair and cleaning. We do not offer gutter replacement or installation. We apologize for any inconvenience.